Bonjour lecteurs! I hope you had a good Friday. You must be looking forward to the weekend. Us too! And to make it even better, we have a fabulous competition for you. 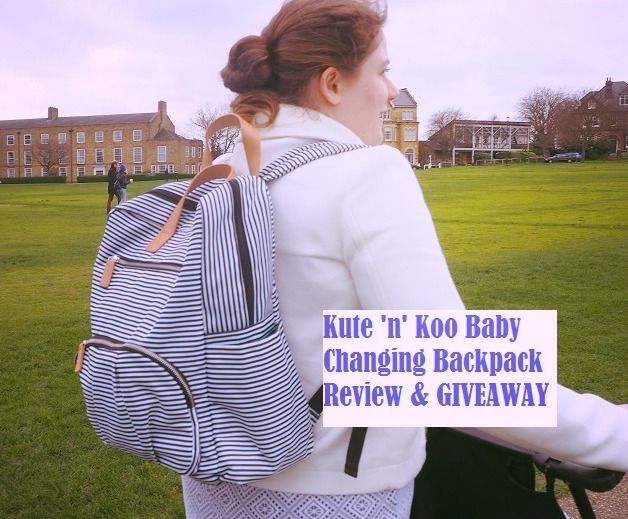 Once you have read our Kute ‘n’ Koo Baby Changing Backpack Review, don’t forget to enter our GIVEAWAY as you can win exactly the same one! Oui, you are not dreaming. The fabuleux Kute ‘n’ Koo Baby Changing Backpack can be yours! Do you remember looking for the perfect changing bag before le bébé arrived? I really struggled to find un sac that would fit all my success criteria. I wanted it to be practical with enough space to carry all the things I needed. Mais I also wanted it to be elegant and stylish so that it could match up easily with my wardrobe. When I started shopping for the perfect changing bag, I remember being so disappointed about it all. If I wanted something really smart, I needed to spend a lot of money. And for what? A bag with a mat. I actually started to use one of my personal handbags when Baba arrived. But it didn’t last long! 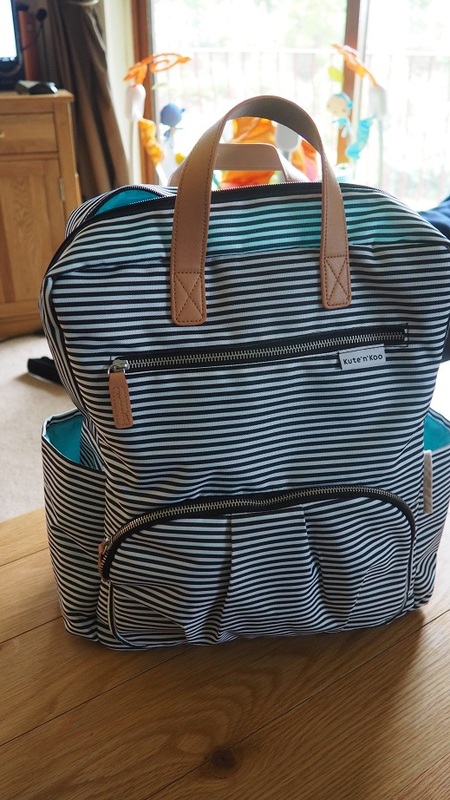 With no clear compartments, it was a mess and I could not find anything… Within two weeks of such a fiasco, I went online and bought a proper changing bag. Hurrah! I could find something within 30 seconds! 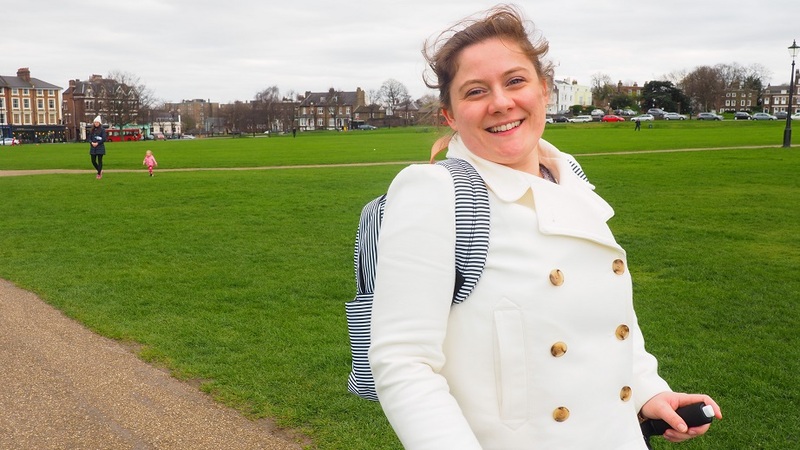 When the brand asked me to write a Kute ‘n’ Koo Baby Changing Backpack Review, I accepted straight away. I just loved the print with the stripes. So Frenchie and I knew it will work with many of my outfits. Frenchie Mummy is a real fashionista like Baba and she can’t resist having a new bag, especially when it has been designed in NYC! Plus the bag is in white, so perfect for the Spring. I am normally not a fan of backpacks. It is simply not my style and I would rather buy a tote. But the Kute ‘n’ Koo Baby Changing Backpack looks really stylish. I feel very confident walking around with it. It is very feminine. When the bag arrived, I was surprised to see how spacious it was. It even thought it would be too big and I wouldn’t be able to find much quickly. You know what it’s like when you are a mummy, you are always on the run and your bag must be practical. I must be able to find the bottle when Baba is screaming for more milk! But having used it for a little while now, I realise that the size is perfect. The bag measures 31.8 x 7.6 x 39.4 cm and you have so much space. C’est super! The bag contains 12 pockets in total! Everything I need fits in the right place: Baba’s snacks and milk, dummies, keys, muslins, my phone. I particularly like the edge pockets. You can just drop anything you may need quickly. The main compartment is so spacious that I can fit all our baby items and more! Is the weather getting a bit too warm? Off we put Baba’s jacket in it. Going out for a long lunch and worried that le bébé will get quickly bored? I stuff it with his favourite toys to keep him busy while I savour my food! Nothing worse than having a crying baby when you have a burger on the table… It just ruins it all! This bag is big! It could almost contain my entire shoes’ collection! Indeed, the bag is so spacious that you can also fit a laptop if you need to get on with your blog! Le sac parfait for Frenchie Mummy! Not only convenient, the Kute ‘n’ Koo Baby Changing Backpack is also really beautiful! I love the stripes and the colours just look really smart. I don’t feel that I am carrying a changing bag. While I am la parfaite maman, I can also remain an elegant lady. The winning equation! The bag is so light I don’t feel tired. Look at the smile on my face! It says it all! The inside colour in blue turquoise is also very feminine and so fresh! I can spot anything easily. I also like the shape. Usually, changing bags tend to be totes. The backpack version is very different. But yet, not boyish at all! It looks very ladylike and smart. Kute ‘n’ Koo Baby Changing Backpack (now £43.95 on Amazon) is a gorgeous bag, perfect for spring 2017. I’m not usually a fan of backpacks but as soon as I tried it I was immediately in love with this bag! The great fabric, added to the stripes makes it feminine but not boyish, and combined with its design and the blue inside, it’s a beautiful looking bag. And it’s wipe-clean. Having a bag that you can wipe-clean is a massive bonus! When you are a mummy, you’re are up to many adventures such as bottles leaking and other stuff. So you want to get a bag that makes you feel good but is at the same time practical and easy to take care of. Do you know a maman who could do with a new fab bag? Don’t you know what to get for Mother’s Day? Look no further! We have it for you! Why don’t you get the most important woman in your life THE treat this year! Then order now a Kute ‘n’ Koo Baby Changing Backpack. We teamed up with this amazing brand. Get 10% off when you order this bag. Simply enter the follow code: RTQ4MIF at the checkout and you will be a stylish mama! 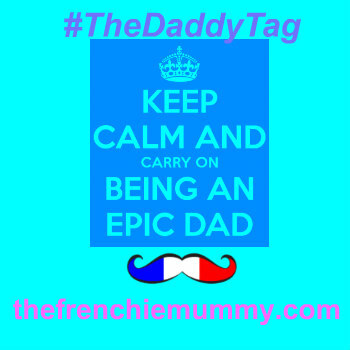 This code is exclusive to the Frenchie Mummy Blog and will be the only place online that anyone can get a discount. It is a time-limited offer which expires on 15th May 2017. Quick! Make the most of it now!!! Disclosure: we were kindly provided with this bag for the purpose of this review. All opinions are my own. 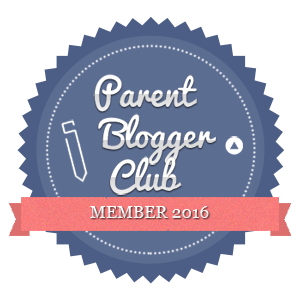 Win a Kute ‘n’ Koo Baby Changing Backpack with Frenchie Mummy! To celebrate Mother’s Day and remind you how awesome you are, we have teamed up with the famous NYC brand and today you can win one of these amazing changing bags! This giveaway starts on Friday 24th March at 8 pm and ends at midnight on Monday 17th April 2017. Provision of the prize is the responsibility of Kute ‘n’ Koo. Thank you! What a gorgeous bag! Practical, useful prize. Enjoyed the video of the pup on Facebook post. What breed of dog is it, as looks nice, cute! Would be nice to see the little pup growing up. Looks like it will be a Beautiful dog, and good natured. This is such a handy changing bag and I love the stripes. I love how practical & stylish this is! Perfect to keep all the essentials for my newborn! Would love to win this amazing bag please! This looks really good and practical. this looks really useful and big enough for all our bits and bobs! I like that it’s a backpack, much easier to carry when your hands are full carrying little one. Great giveaway! ? Thanks ? Love the design, and I do love a good backpack. Also, stripes are like..my thing. Haha. just found out I am pregnant with our second child, would love to win this now i will have lots more stuff to carry round i need a bigger bag! Gorgeous bag – and it looks so useful and practical too! I love navy and white stripes! Lovely bag! Oohh this looks fab i love it! About to have a baby boy and looking for something more practical to carry around and this looks perfect (I’m sure OH would wear it too!). Looks very durable too so useful even when he’s grown out of nappies (always need a pack of wipes though!). How lovely! I’m such a sucker for a nautical stripe! I’m usually a tote bag gal like yourself but I’m loving the idea of trying a backpack! Love the design of this bag. So useful and practical too. That bags great, you’d never realize it was a changing bag just looking at it. what a lovely bag, looks like you can get loads in there. oh love this bag, my grandson is due in july so this would be a very welcome addition. Lovely bag. With lots of handy pockets. I’ve been looking for a rucksack style change bag and this looks perfect! Brilliant prize. We have a backpack as a changing bag! Much easier especially once they’re at toddler stage and you don’t always take the pushchair out to store a hefty bag under. Nice bag, great giveaway….fingers crossed! 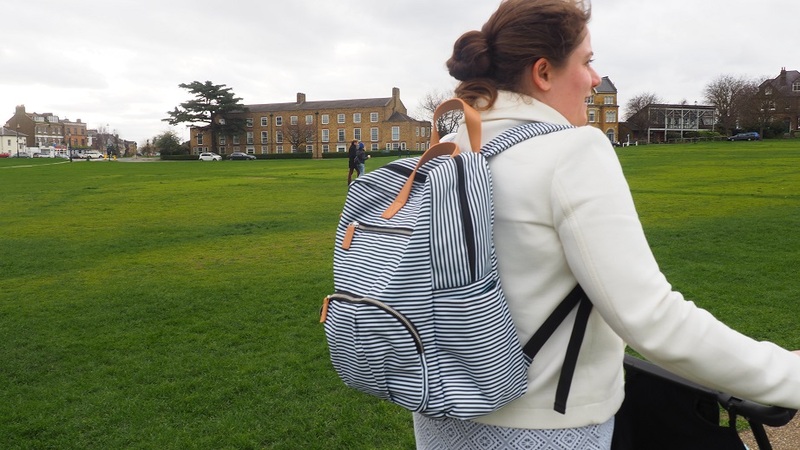 A capacious and well designed back pack in a classy stripe. What is not to like? This is so lovely. Thank you for running this great competition an thanks for the chance. Thank you for the chance to win this amazing bag! Not only does it look super stylish but is so practical too, with loads of room for everything we need! This bag is awesome. I am sick and tired of having to cram nappies and wipes and all the other fun stuff you need just to pop out into stupid places then forget where they are. I love the look of the bag too, awesome prize.